The VAX-D table was invented by Dr. Allan E. Dyer, M.D., Ph.D. the former Deputy Minister of Health of Ontario, Canada and the developer of the heart defibrillator. His initial purpose was to treat low back pain from herniated discs and/or degenerated disc disease. Over the last few years it has shown great promise treating back pain associated with facet arthropathy and related arthritic changes. VAX-D is an acronym for Vertebral Axial Decompression. The table is a FDA approved device that applies a measured amount of distraction force to the intradiscal spaces of the lumbar spine. The table consists of two halves. The patient lies prone with his upper body supported by the fixed or caudal section. This section contains handgrips, which the patient grasps to restrain movement as pressure is applied. A specially designed harness is fitted around the pelvic girdle that attaches to the end of the moveable or caudal section. There is a tensionometer to measure the amount of distraction force applied attached to the caudal section. This force is preset and monitored by a technician or physician at a nearby operation console and graphically displayed as function of time on recording paper which becomes part of the patient’s chart. 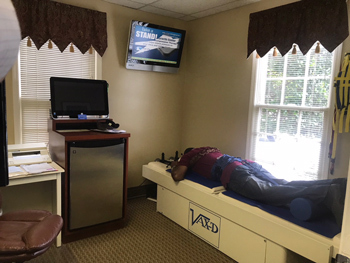 The therapy consists of applying the distraction force gradually by extending the lower half of the table away from the body’s midsection thus creating pressure on the pelvic harness. This force is exerted fifteen (15) times in one (1) minute intervals with a relaxation time of thirty (30) seconds in-between the distraction cycles. 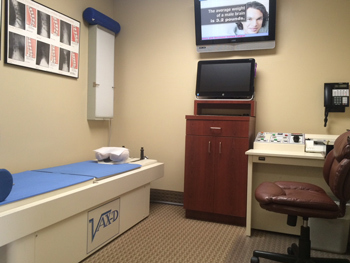 The approximate time of VAX-D treatment lasts for thirty (30) minutes. Currently the recommended number of sessions is twenty. The initial and still the most frequent indications for Vertebral Axial Decompression are a herniated nucleus pulposus either subligamentous or extruded and degenerative disc disease. This has been borne out by two clinical studies and clinical experience in over 80 locations where VAX-D therapy has been used. More recently, older patients with facet arthropathy have also benefited from decompression therapy by reducing pain and increasing function. The first study to evaluate the efficiency of the VAX-D therapy was conducted at the University Hospital in London, Ontario in 1987 and 1988. The hospital is the main teaching hospital for the University of Western Ontario. Patients between the ages of 18 and 70 were referred from the community for acute onset of low back pain within the previous 30 days. Patient’s received a CT Scan of their lumbar spine as well as a medical evaluation and work up. Patient’s pain and disability were rated on a session by session basis using the Oswestry Pain and Disability Scale. The study design, originally set up as a double blind, placebo control trial, could not be sustained due to intra patient communication and the protocol was altered to a randomized control trial comparing VAX-D to conventional medical therapy. Sixty six percent achieved a 50% reduction in pain and disability by the end of their shortened treatment program. In 1992, the Departments of Neurosurgery and Radiology of the University of Texas at McAllen, Texas conducted a clinical study at Rio Grande Regional Hospital in McAllen, Texas. Patients were referred from the community after failing conventional medical therapy. Furthermore, patients were not excluded if they had chronic low back pain or prior back surgery. Unlike the London Ontario study, the character of disease in the patient population was, by definition, chronic. In addition, over 60% of the patients had worked at a local automobile assembly plant and were on workers compensation. The inclusion and exclusion criteria were otherwise the same in both studies. All patients received an MRI as part of their work up. Treatment consisted of 15 sessions of VAX-D therapy. Success was defined as sufficiently pain and disability free to return to work. The patient population eventually numbered 57, out of which 52 were diagnosed with a herniated nucleus pulposus, 38 subligamentus and 9 extruded. Thirty-seven patients or 71% went into remission. 13 patients diagnosed with herniated discs were also diagnosed with degenerative disc disease. However, the group with both diagnoses showed the same percent remission as those with the herniated disc alone. And finally, follow up at 1,4, and 8 months revealed no relapse. The basis for the efficacy of the VAX-D therapy was at least partially evaluated by Ramos and Martin in their September, 1994 Journal of Neurosurgery article. While the clinical trial, summarized above, was being conducted, 5 patients were studied to determine the effect of VAX-D on intradiscal pressures. Patients had a cannula with a pressure transducer inserted into the L4-L5 disc space to measure the change in pressure as 50 to 100 psi of distraction force was applied by the VAX-D table. As the force reached 100 psi intradiscal pressures reached a negative 160 mm Hg. The strong implication of this work is that the negative intradiscal pressures created the conditions necessary for return of the nucleus pulposus to its more anatomically correct position. In fact, additional work by Ramos and Martin (unpublished) showed the myelogram filling defect shown on fluoroscopy corrected itself as distraction force was increased*. In addition, follow up MRIs on successfully treated patients with subligamentus herniated discs showed retraction of disc material into normal anatomic position*. Contraindications include instability of lumbar spine due to spondylolisthesis, spondylolysis, trauma or prior surgery, certain pathologic lesions of spine, severe osteoporosis, congenital or par defects and severe active arthritis. No one is claiming that VAX-D is a panacea, nor that it will eliminate the need for surgery, but it does seem to make sense that the surgical option should be reserved for failures to respond to more conservative approaches. It also seems reasonable that the initial modality undertaken should be cost effective, and that for most patients a more attractive option. Keep in mind that several independent clinical trials, at different settings, have shown that VAX-D is a remarkably effective addition to a practitioner’s armamentarium for treating patients with crippling low back pain.